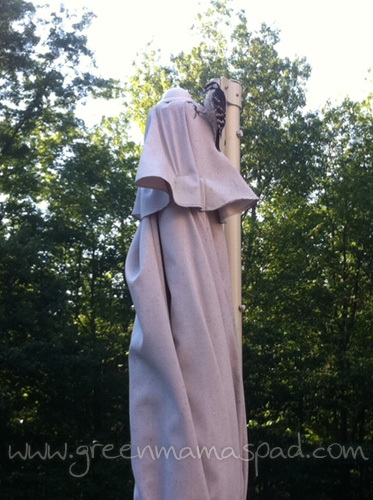 The other morning I was sitting at the kitchen table, with the slider to the deck open for fresh air, when I started hearing a knocking noise. 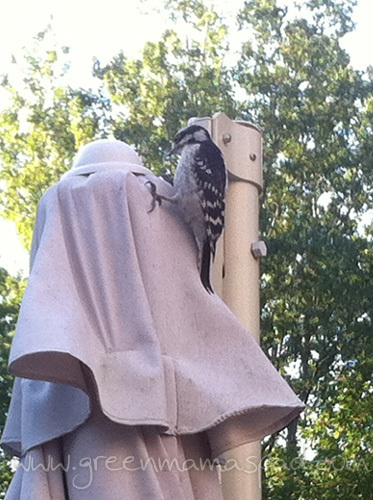 I turned around and looked through the door to see this female woodpecker pecking at our deck umbrella. I guess she must have thought it was a tree but unfortunately for her there were no tasty bugs inside. If you are up for a quick video, you can see her in action. That's hilarious! Maybe he's used to wooden umbrellas?! aw man! at least it was nice and soft on her beak for once! Poor woodpecker, all that work for nothing, lol. Woodpeckers can be such crazy birds! We had one that would come around when I was little and it would peck on this old steel crane tower for hours on end, it seemed to happen every summer. I always wondered what the heck it was pecking at up there! huh! it's pretty awesome when you can catch the oddest things on camera! Happy Wordless Wednesday! Great Pictures!! I am always trying to catch a woodpecker in action but havent had any luck yet! Hope you have a great rest of the week! The ones around here like to peck at our gutters. It vibrates the whole house! LOL! He certainly does look a bit confused! Too funny! I hope he didn't put a hole in your umbrella! Cool shot! He sure is a determined little fella! Thanks for the linky too. How funny! These are great shots. Poor, silly bird! We had a red-bellied woodpecker visiting our finch feeder daily a few months back. I'm a little sad that I haven't seen her in a while. Must be the bird. My parents had one that used to peck on the metal part of the chimney. It took us forever to figure out what the noise was. Poor mama... she's gonna go hungry. I hope she didn't do any damage to the umbrella. Poor guy! I hope he finally found a tree! Following your lovely blog. I am also inviting you to visit http://olahmomma.com/momlounge where you can ( add your blog ), express yourself, add your business/giveaways, and meet and be seen with more mom bloggers.